With the work of the National Planning Commission; the development of the New Growth Path; as well as the accord signed between Government, labour, civil society and business in 2011, Bhojaram states that what Government is planning in order to stimulate the economy is commendable but plans need to be put into action. Bhojaram urges the Minister of Economic Development, Mr. Ebrahim Patel to urgently consider the Consulting Engineering Sector as a designated sector for local preference ensuring a better platform for job creation, attracting young people to join the sector thus accelerating training and development. In order to encourage private sector to invest in the development of infrastructure projects Bhojaram believes that we need to be entrepreneurial about project delivery mechanisms. The easing of Public Private Partnership regulations will facilitate this. 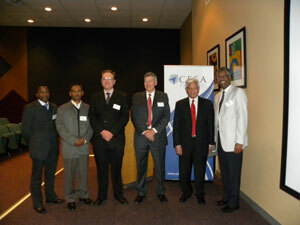 CESA is willing to actively participate in order to accelerate service delivery and job creation. CESA is very concerned about the inconsistencies between the newly promulgated Preferential Procurement Framework Act Regulations and the Construction Sector Codes of Good Practice promulgated in terms of the BBBEE Act. CESA is calling upon National Treasury and the Department of Trade and Industry to urgently address these inconsistencies. CESA is concerned that the newly promulgated PPPFA Regulations that came into effect on 7 December 2011 have once again under special notice from the Minister, exempted State Owned Entities. Bhojaram states, “We would like to see a return to sanity – Private Sector is compelled to abide by these Regulations, but State Owned Entities do not have to satisfy their own or Government’s Regulations with respect to transformation.” The issue lies with National Treasury for allowing this exemption. It is important that Parastatals comply with the legislation not because their own systems are no good but there is a need for uniformity in procurement in our industry which will result in a win win for all. Bhojaram strongly believes that in the Procurement of Professional Services that the element of ‘Quality’ must be included in these regulations as a single process and not just as a pre-qualifier. Technical evaluation of tenders must include input from technical professionals in the bid evaluation committees. He maintains that political undermining of the opinion and value add of these professionals will continue to be a deterrent in attracting these skills back into the public sector. He strongly contends that engineering has become an unattractive industry on account of the profession being reduced to a mere commodity with appointments being made on the basis of the cheapest price, with expertise and experience not considered adequately. In answering the question of “Where does the power really sit with the procurement of professional services” Bhojaram stated that our country’s current lack of institutional strength within Government is a breeding ground for corruption. He believes that the one thing that we can all do to grow our economy is to address the issue of Business Integrity not only at a corporate level but on an individual level. CESA member firms are being asked to focus their attention on every single employee. He believes that Business Integrity is not only about companies, government or institutions, but about individual human beings – honesty is the only way! All CESA member firms are constitutionally required to have a Business Integrity Management System (BIMS) in place. “We will continue to bring top of the mind awareness to our members and individuals in our industry to continuously explore their personal ethical balance so that we remain “CESA Engineers – Unquestionably Ethical” concluded Bhojaram.